What do multi-national energy projects and small digital agencies have in common? Firstly, they both need the right skills to succeed. Secondly, both play a key role in the Somerset economy. 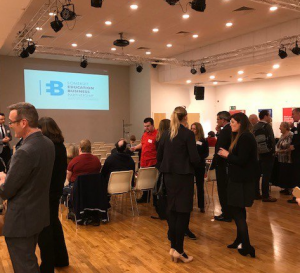 These were just two business sectors represented at the Somerset Education Business Partnership launch on Wednesday 24 October. As EDF build Hinkley Point C on the Somerset coast, they and their local authority partners are working hard to maximise the benefit of this local investment through the Hinkley Point C Community Impact Mitigation Fund. Recognising the importance of skills to the local economy, the fund has invested to create the Somerset Education Business Partnership. Over 70 education and business partners gathered to hear of local partnership opportunities and to share their thoughts on maximising these. A wealth of good practice already exists in Somerset from large programmes such as EDF inspire through to hyper-local engagement between small businesses and partner schools. However, the clear message on the night was that partners want to do more – and that engagement must be easy and accessible for all partners. The role of modern media in reaching different audiences across Somerset’s large area was emphasised. One suggestion was to make short films at several employers and to share these with young people in their class-rooms – reducing the demand on employer and school travel time and costs. Other strong themes included finding a common language to unify business and education partners behind a shared, locally driven campaign. As Somerset enjoys high employment levels many businesses face recruitment challenges. We were really encouraged to see strong support for the examples of ‘disability confident’ employment shared on the evening. This demonstrated that local employers understand the social and business benefits of recruiting skilled and loyal employees who face barriers to accessing work. These messages will shape the work of the Somerset Education Business Partnership team as they engage with the many partners who work hard to give young people the employer encounters and enterprise experience that can inspire them to find the pathways they are best suited to. We look forward to sharing our progress and to learning from the other Education Business Professionals meeting needs in their localities.